Wake Forest first fielded a football team in 1888. The team was coached by W. C. Dowd and W. C. Riddick. That team played only one game, and went 1–0, a victory against North Carolina in the first-ever collegiate football game played in the state of North Carolina. From 1891 to 1893, under head coach E. Walter Sikes, Wake Forest posted a 6–2–1 record. Harry Rabenhorst coached Wake Forest for two seasons, posting a 3–8 record. Hank Garrity served as head football coach from 1923–1924. He compiled a 19–7–1 record in those two seasons. His .704 winning percentage is the highest in Wake Forest football history. F. S. Miller served as Wake Forest's head football coach for four seasons, posting a record of 18–15–4. His first two seasons were winning seasons, 6–5–1 and 5–3–1, respectively. Jim Weaver, who would become the ACC's first commissioner, coached the Demon Deacons football team for four seasons. His final record is 10–23–1. Peahead Walker came to the Demon Deacons from Elon and was Wake Forest's head football coach for fourteen seasons, compiling a record of 77–51–6. He is tied with Jim Grobe as the winningest head football coach in Demon Deacon football history. Walker led the Deacons to two bowl games, a win over South Carolina in the inaugural Gator Bowl in 1946 and a loss to Baylor in the 1949 Dixie Bowl. He resigned after the 1950 season and was inducted into the Wake Forest Athletics Hall of Fame in 1971. Tom Rogers led the Demon Deacons from 1951–1955, succeeding Walker. Rogers yearly records at Wake Forest were 6–4, 5–4–1, 3–6–1, 4–7–1 and 5–4–1. In 1951, the Demon Deacons compiled a 6–4 record and finished in a tie for seventh place in the Southern Conference. End Jack Lewis and linebacker Bill George were selected by the Associated Press as first-team players on the 1951 All-Southern Conference football team. In their second season under Rogers, the Demon Deacons compiled a 5–4–1 record and finished in a tie for second place in the Southern Conference with a 5–1 record against conference opponents. End Jack Lewis was selected by the United Press as a first-team player on the 1952 All-Southern Conference football team. This was followed by a 3–6–1 campaign in 1953 that saw Wake Forest finish in a three-way tie for third place in the Atlantic Coast Conference with a 2–3 record against conference opponents. In 1954, the Demon Deacons compiled a 3–6–1 record and finished in sixth place in the Atlantic Coast Conference with a 1–4–1 record against conference opponents. End Ed Stowers and tackle Bob Bartholomew were selected by the Associated Press as first-team players on the 1954 All-Atlantic Coast Conference football team. Bartholomew was the only unanimous selection by all 43 voters. In 1955, their fifth season under Rogers, the Demon Deacons compiled a 5–4–1 record and finished in fourth place in the Atlantic Coast Conference with a 3–3–1 record against conference opponents. Tackle Bob Bartholomew was selected by both the Associated Press and the United Press International as a first-team player on the 1955 All-Atlantic Coast Conference football team. Rogers was replaced as Wake Forest head coach after five seasons. Paul Amen, who succeeded Rogers, came to Wake Forest from his post as an assistant at Army and also struggled but managed to go 6–4 in his final season, his only winning record. He coached the Demon Deacons from 1956–1959. In their first season under Amen, the Demon Deacons compiled a 2–5–3 record and finished in seventh place in the Atlantic Coast Conference with a 1–5–1 record against conference opponents. Halfback Billy Ray Barnes rushed for over 1,000 yards and was selected by the Associated Press as a first-team player on the 1956 All-Atlantic Coast Conference football team. Amen's 1957 team posted a winless 0–10 record. This was followed by a 3–7 season in 1958. In 1958, the Demon Deacons compiled a 6–4 record and finished in a tie for fourth place in the Atlantic Coast Conference. Quarterback Norm Snead and end Pete Manning were selected by the Associated Press and United Press International as first-team players on the 1959 All-Atlantic Coast Conference football team. Snead later played 16 seasons in the NFL and was a four-time All-Pro selection. Guard Nick Patella was selected to the All-ACC team by the UPI. Amen was selected in 1956 and 1959 as ACC Coach of the Year, however, Amen retired after four seasons. Billy Hildebrand was promoted from defensive line coach to head coach following Amen's retirement. Hildebrand, like his predecessors, struggled to find much success. His best season came in 1961 in which the Demon Deacons posted a 4–6 record. In its first season under Hildebrand, the Demon Deacons compiled a 2–8 record and finished in seventh place in the Atlantic Coast Conference (ACC). Quarterback Norm Snead was selected by the United Press International as a first-team player on the 1960 All-Atlantic Coast Conference football team. Snead later played 16 seasons in the NFL and was a four-time All-Pro selection. In 1961, its second season under head coach Hildebrand, the team compiled a 4–6 record and finished in seventh place in the Atlantic Coast Conference (ACC). Halfback Alan White was selected by the Associated Press as a first-team player on the 1961 All-Atlantic Coast Conference football team. In 1962, the team compiled a 0–10 record and finished in last place in the Atlantic Coast Conference (ACC). This was followed by a 1–9 campaign in 1963 that saw Wake Forest finish in seventh place in the Atlantic Coast Conference (ACC). After four seasons and a 7–33 overall record, Hildebrand was fired. Bill Tate was hired as the Demon Deacons head football coach in January 1964. Tate coached the Demon Deacons for five seasons. In its first season under Tate, the team compiled a 5–5 record and finished in a three-way tie for third place in the Atlantic Coast Conference (ACC). Three players received first-team All-ACC honors from the Associated Press: fullback Brian Piccolo, quarterback John Mackovic, and end Richard Cameron. Piccolo was a unanimous selection for the all-conference team, and was also selected as a first-team All-American by Football News. He set three ACC records in 1964 with 1,044 rushing yards, 111 points scored, and 17 touchdowns. Piccolo also led the nation in 1964 in rushing yards, rushing touchdowns, and points scored. He was named the Atlantic Coast Conference (ACC) Player of the Year, yet went unselected in the both the AFL and NFL drafts. Mackovic led the Demon Deacons with 1,340 passing yards while completing 89 of 195 passes. Cameron caught 29 passes for 410 yards. From 1964–1968, Wake Forest posted a 17–32–1 record and steadily declined year-by-year, going from 5–5 in Tate's first year worsening each year to 2–7–1 in his last. Tate won ACC Coach of the Year honors in 1964 but was fired after failing to post a winning record in any of his five seasons. Cal Stoll was hired as Wake Forest's head coach away from Michigan State, where he served as an assistant. Stoll was able to have success with the Deacons, posting a 3–7 record his first year then back-to-back 6–5 records in his last two. In 1969, their first season under Stoll, the Demon Deacons compiled a 3–7 record and finished in seventh place in the Atlantic Coast Conference. In 1970, the team compiled a 6–5 record, finished in first place in the Atlantic Coast Conference with a 5–1 record against conference opponents. In their third season under Stoll, the Demon Deacons compiled a 6–5 record and finished in a tie for fifth place in the Atlantic Coast Conference. Stoll left Wake Forest after the 1971 season to take the head coach position at his alma mater Minnesota after initially declining the job. His final record was 15–17 and included Wake Forest's first ACC championship in 1970. Stoll won ACC Coach of the Year honors in 1970. Tom Harper was promoted from assistant coach to head coach following Stoll's departure. In their first and only season under Harper, the Demon Deacons compiled a 2–9 record and finished in a tie for last place in the Atlantic Coast Conference. Harper was replaced as Wake Forest's head football coach after the 1972 season. Chuck Mills was hired away from Utah State and served as the Demon Deacons head football coach for five seasons, compiling an 11–43–1 record before he was fired due to the team's continued lackluster on-the-field performance. In 1973, Mills' first season, the Demon Deacons compiled a 1–9–1 record and finished in last place in the Atlantic Coast Conference. This was followed by a 1–10 record and last place finish in the Atlantic Coast Conference in 1974. Mills' third season in 1975 saw the Demon Deacons go 3–8 record and finish in fourth place in the Atlantic Coast Conference. In 1976, the Demon Deacons compiled a 5–6 record and finished in third place in the Atlantic Coast Conference. In their fifth and final season under Mills in 1977, the Demon Deacons compiled a 1–10 record and finished in last place in the Atlantic Coast Conference. Purdue offensive coordinator and associate head coach John Mackovic took over as head coach of his alma mater in 1978 and re-energized the Wake Forest football program, turning the program around from 1–10 to 8–4 in one year, for which Mackovic won ACC Coach of the Year honors. His teams were aggressive and fast. In 1979, its second season under head coach John Mackovic, the team compiled an 8–4 record, finished in fourth place in the Atlantic Coast Conference, and lost to LSU in the 1979 Tangerine Bowl. Mackovic won the Walter Camp Coach of the Year Award in 1979. In its third season under head coach John Mackovic, the team compiled a 5–6 record and finished in a three-way tie for fourth place in the Atlantic Coast Conference. Following the 1980 season, Mackovic left Wake Forest to take an assistant coaching position with the NFL's Dallas Cowboys. Mackovic's final record at Wake Forest is 14–20. 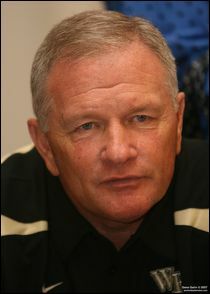 Under head coach Al Groh, the Demon Deacons compiled a 26–40 record. In 1981, their first season under Groh, the Demon Deacons compiled a 4–7 record and finished in sixth place in the Atlantic Coast Conference. In their second season under Groh, the Demon Deacons compiled a 3–8 record and finished in last place in the Atlantic Coast Conference. In their third season under Groh, the Demon Deacons compiled a 4–7 record and finished in a tie for last place in the Atlantic Coast Conference. Groh's best season was a 6–5 1984 season. and Groh resigned after the 1986 season, a 5–6 campaign, to take an assistant coaching position with the National Football League's Atlanta Falcons. Bill Dooley, brother of former Georgia head football coach Vince Dooley and uncle of former Louisiana Tech and Tennessee head football coach Derek Dooley, came to Wake Forest after a brief retirement from coaching. He had previously been head football coach at Virginia Tech and North Carolina. In Dooley's first season, the team compiled a 7–4 record and finished in a tie for third place in the Atlantic Coast Conference. The next year, Wake Forest compiled a 6–4–1 record and finished in a tie for fourth place in the Atlantic Coast Conference. In 1989, the Demon Deacons compiled a 2–8–1 record and finished in seventh place in the Atlantic Coast Conference. The following season, Wake Forest finished with a 3–8 record and finished in last place in the Atlantic Coast Conference. In 1991, Wake Forest again finished last in the ACC with a 3–8 record. Dooley led the Demon Deacons to one bowl game, the 1992 Independence Bowl, which Wake Forest won, capping off an 8–4 season in which they finished ranked #25 in both the AP and Coaches Polls, respectively. Dooley re-retired after that game. Dooley retired after the 1992 season. His six seasons in Winston-Salem are tied for fourth for longest tenure and his 29 wins are third in most wins in Wake Forest history. He had three winning seasons at Wake Forest, 7–4 in 1987, 6–4–1 in 1988, and the 8–4 1992 team. Dooley's final record is 29–36–2. Jim Caldwell came to Wake Forest from his post as quarterbacks coach at Penn State. Caldwell was the first African American head football coach in Wake Forest football history. Caldwell's Demon Deacons were known to pass the ball well, but struggled to run the ball, with one season the leading rusher only gaining a total of 300 yards for the entire season. Caldwell's first season was 1993, during which the Demon Deacons compiled a 2–9 record and finished in last place in the Atlantic Coast Conference for the third year in a row. In 1994, the Demon Deacons compiled a 3–8 record and finished in eighth place in the Atlantic Coast Conference. That was followed by a 1–10 record and last place finish in the Atlantic Coast Conference for the fourth time in five years. 1996 was another season of struggle, as the Wake Forest Demon Deacons compiled a 3–8 record and finished in a tie for sixth place in the Atlantic Coast Conference, their best such finish in the ACC in over a decade. In 1997, the Demon Deacons compiled a 5–6 record and finished in a tie for sixth place in the Atlantic Coast Conference. The highlight of the season came on opening weekend, when the Demon Deacons upset then No. 21 Northwestern by a score of 27–20, their first win over a ranked opponent in over a decade. In 1998, the Demon Deacons compiled a 3–8 record and finished in a tie for sixth place in the Atlantic Coast Conference. That was followed by the only winning season of Caldwell's tenure. In 2000, the Demon Deacons compiled a 2–9 record and finished in eighth place in the Atlantic Coast Conference. Wake Forest struggled in Caldwell's eight-year tenure, posting only one winning season (a 7–5 1999 season, capped with a win in the 1999 Aloha Bowl). Caldwell was fired after the 2000 season. His final record at Wake Forest is 26–63. Coach Jim Grobe came to Wake Forest from Ohio. He brought with him an aggressive defensive scheme and a philosophy of discipline and accountability for his players both on the field and off. In their first season under Grobe, the Demon Deacons compiled a 6–5 record and finished in a tie for seventh place in the Atlantic Coast Conference. In 2002, the Demon Deacons compiled a 7–6 record and finished in a tie for seventh place in the Atlantic Coast Conference. This was followed by a 5–7 campaign and seventh-place finish in the Atlantic Coast Conference. In 2004, the Demon Deacons compiled a 4–7 record and finished in a tie for last place in the Atlantic Coast Conference. That year, Wake Forest lost a close game on homecoming to then No. 5 Florida State on a field goal with one minute remaining in the contest by a score of 20–17. In their fifth season under Jim Grobe, the Demon Deacons compiled a 4–7 record and finished in fourth place in the Atlantic Division of the Atlantic Coast Conference. Grobe's best season was 2006, when the Demon Deacons posted an 11–2 record, won their first ACC championship in 36 years, and played in the Orange Bowl, a game they lost to Louisville. For the team's success in 2006, Grobe was awarded the ACC coach of the Year, Bobby Dodd Coach of the Year Award and AP Coach of the Year Award. Grobe's 77 wins are tied with Peahead Walker for most in Wake Forest football history. After that 2006 season, Grobe's teams weren't able to match that level of success, winning six or more games just three times in the next seven years. Following the most successful season in team history in 2006, the 2007 team was not widely predicted to win the ACC despite returning many offensive starters from 2006. Some sports writers stated that they believed 2006 to have been a fluke and that Wake Forest was not going to win as many games in 2007, especially because of the losses on defense, including the loss of linebacker Jon Abbate to the National Football League. Wake Forest was picked to finish fourth in the Atlantic Division of the ACC in the annual preseason poll conducted by the Atlantic Coast Sports Media Association. Lindy's was the only major preseason magazine to pick Wake Forest as a Top-25 team. The team began its season with an Atlantic Coast Conference (ACC) game on Saturday, September 1, 2007 against Boston College. Wake Forest played its first season since winning the 2006 ACC championship, their first in 36 years. Wake Forest would finish the season with a 9–4 (5–3 ACC) record. A win in the 2007 Meineke Car Care Bowl against UConn gave the Deacons twenty wins over the last two seasons. In 2008, Wake Forest's 56th season as a member of the ACC the Demon Deacons began their season on August 28 at Baylor. The team finished 8–5 overall and 4–4 in ACC play, and beat Navy in the inaugural EagleBank Bowl on December 20, 2008. The 2009 season saw the Demon Deacons finish the season with a record of 5–7 and 3–5 in ACC play. The Deacons missed out on a bowl game for the first time since the 2005 season. In 2010, the Demon Deacons had another year of struggles, finishing 3–9, 1–7 in ACC play. This was followed by a 2011 season in which the Demon Deacons finished 6–7 and 5–3 in ACC play to finish in a tie for second place in the Atlantic Division. They were invited to the Music City Bowl where they were defeated by Mississippi State by a score of 23–17. The 2012 season saw Wake Forest finish 5–7 with a 3–5 record in ACC play. Grobe resigned as head coach after the 2013 season, a 4–8 campaign, with a 77–82 overall record. Dave Clawson was hired away from Bowling Green as the Demon Deacons head football coach, his hiring made official at a press conference on December 10, 2013. Clawson brought with him a coaching style that utilizes the team's available talent to maximize success. His offensive philosophy focuses on getting individual playmakers more touches rather than sticking to a rigidly-defined system. After posting 3–9 (1–7 ACC) seasons in 2014 and 2015, Clawson's 2016 team started the season by winning five of its first six games including road victories at Duke and Indiana. He led Wake Forest to its first bowl win in eight years, beating then No. 23 Temple 34–26 in the Military Bowl. Clawson has re-built the Deacons using a philosophy of strong recruiting classes, redshirting as many freshmen as possible, and having a strong strength and conditioning program. After the 2016 season, Wake Forest signed Clawson to a contract extension. The Demon Deacons finished 8–5 in 2017. The Demon Deacons kicked off the season on August 31 with a 51–7 victory over FCS Presbyterian. In the season's second game, Wake defeated Boston College by a margin of 34–10. After a 46–10 drubbing of Utah State, Clawson's squad picked up their fourth win of the season in their fourth game by virtue of a 20–19 nail biter over Appalachian State. Then the Demon Deacons embarked upon a three-game losing streak, beginning with a 26–19 loss to Florida State. On October 7, Wake Forest lost to #2 Clemson by a score of 28–14. After a 38–24 loss to Georgia Tech, Wake posted its fifth victory of the season with a 42–32 win over Louisville with wide receiver Greg Dortch hauling in a school-record 4 TD receptions. After a 48–37 loss to #5 Notre Dame, the Demon Deacons ran all over Syracuse in an offensive shootout, prevailing by a margin of 64–43. After a 30–24 victory over archrival #25 NC State, Clawson's squad lost to rival Duke by a score of 31–23 in the regular season finale. Wake Forest was offered and accepted a berth in the 2017 Belk Bowl, a game they won over Texas A&M by a score of 55–52. The following year, they were offered and accepted a berth to the 2018 Birmingham Bowl, in which they beat Memphis 37–34. Wake Forest has been independent and affiliated with two conferences. Wake Forest has played in 13 bowls in its history and owns a 9–4 record in those games. For the 2006 season, the school earned a bid to its first ever BCS game, with an Orange Bowl match-up against Louisville. Wake also had played in the 1982 Mirage Bowl in Tokyo, Japan against Clemson. However, because this game was played during the regular season, the NCAA does not recognize it as an official bowl game. Wake also competed in the 1951, 1953, 1954 Tobacco Bowl in Richmond, Virginia. According to the NCAA, it doesn't count as an official bowl game since this game isn't a postseason bowl. Wake Forest is referred to as being a part of "Tobacco Road" or the Big Four, terms that refer to the four North Carolina schools that compete heatedly against each other within the ACC. Wake Forest swept the series with its Tobacco Road rivals in 1924, 1951, 1970, 1984, 1987, 2006, and 2007. Wake Forest defeated North Carolina 6–4 on October 18, 1888 during the first intercollegiate football game played in the state of North Carolina. Wake's all-time record against UNC is 36–68–2. Wake Forest is 37–57–2 against in-state rival Duke. Wake Forest also plays out-of-conference foe Vanderbilt on a semi-regular basis. They had a contract through 2013 to play during the final "rivalry week" of the regular season after the 2014 & 2015 games were cancelled and subsequently replaced by new opponents. The two teams are not scheduled to play again until the 2022 & 2023 seasons. Wake is 6–10 against Vanderbilt since the teams first played in 1964. The ACC and SoCon All Decade, and the all–conference lists aren't complete. The all–conference lists include selections for 1st team, 2nd team, and honorable mention. Jon Abbate – Former NFL linebacker; the central figure in The 5th Quarter, a 2011 feature film on Wake's 2006 season after his brother (Luke Abbate) died in a car accident. George Coghill – Former NFL defensive back who won back–to–back Super Bowl rings with the Denver Broncos in 1998 and 1999. Clark Gaines – Former NFL running back, holds NFL record for most receptions in a game by a running back (3rd most receptions in a game among all players), and was the first undrafted rookie to rush for over 500 yards in a rookie season; currently serves as Assistant Executive Director of the NFL Players Association. Norm Snead – Four time Pro Bowl quarterback. ^ a b "Fit for Battle". google.com. ^ "E. Walter Sikes". shelf3d.com. ^ "Harry Rabenhorst". College Football at Sports-Reference.com. ^ "Hank Garrity". College Basketball at Sports-Reference.com. ^ "The Demon Deacon's Past". oldgoldandblack.com. ^ a b "F.S. Miller". College Football at Sports-Reference.com. ^ "James H. Weaver Papers". wfu.edu. ^ "Jim Weaver". College Football at Sports-Reference.com. ^ "D.C. Walker". College Football at Sports-Reference.com. ^ "Person familiar with situation: Coach Jim Grobe resigning after 13 years at Wake Forest". Fox News. ^ "Gator Bowl Association". gatorbowl.com. Archived from the original on September 28, 2007. ^ "The Official Site of Wake Forest Demon Deacon Athletics – Traditions". wakeforestsports.com. ^ "Tom Rogers". College Football at Sports-Reference.com. ^ "1951 Wake Forest Demon Deacons Schedule and Results". SR/College Football. Sports Reference LLC. Retrieved December 24, 2015. ^ "All-Southern Conference Teams". The Morning Herald, Hagerstown. November 29, 1951. p. 13. ^ "1952 Wake Forest Demon Deacons Schedule and Results". SR/College Football. Sports Reference LLC. Retrieved December 24, 2015. ^ "All-Southern Team Dominated by Duke S. C. and Maryland". Aiken Standard and Review. November 26, 1952. p. 8. ^ "1953 Wake Forest Demon Deacons Schedule and Results". SR/College Football. Sports Reference LLC. Retrieved December 24, 2015. ^ "1954 Wake Forest Demon Deacons Schedule and Results". SR/College Football. Sports Reference LLC. Retrieved December 24, 2015. ^ "Six Members Place on All-ACC Eleven". The Morning Herald, Hagerstown, MD. November 30, 1954. p. 15. ^ "1955 Wake Forest Demon Deacons Schedule and Results". SR/College Football. Sports Reference LLC. Retrieved December 24, 2015. ^ "Maryland Places Five On All ACC Football Team". November 25, 1955. p. 11 – via newspapers.com. ^ "All ACC Team". November 23, 1955. p. 20 – via newspapers.com. ^ a b c d "Paul Amen". College Football at Sports-Reference.com. ^ "1956 Wake Forest Demon Deacons Schedule and Results". SR/College Football. Sports Reference LLC. Retrieved December 24, 2015. ^ "Bill Barnes Tops All-ACC Team Voting". The Bee: Danville, Virginia. November 28, 1956. p. 3. ^ "1958 Wake Forest Demon Deacons Stats - College Football at Sports-Reference.com". College Football at Sports-Reference.com. ^ "1959 Wake Forest Demon Deacons Schedule and Results". SR/College Football. Sports Reference LLC. Retrieved December 24, 2015. ^ ""Home-Grown" All-ACC Team Picked By Associated Press". The Progress-Index. December 2, 1959. p. 24. ^ a b "Clemson Puts Four on All-ACC Selection". Statesville Record & Landmark. December 2, 1959. p. 17. ^ "Former Wake Forest Head Football Coach Paul Amen Passes Away". wakeforestsports.com. ^ "Times Daily – Google News Archive Search". google.com. ^ a b "Billy Hildebrand". College Football at Sports-Reference.com. ^ "1960 Wake Forest Demon Deacons Schedule and Results". SR/College Football. Sports Reference LLC. Retrieved December 24, 2015. ^ Bob Gately (November 28, 1960). "All-ACC Team". Kingsport Times. p. 6. ^ "1961 Wake Forest Demon Deacons Schedule and Results". SR/College Football. Sports Reference LLC. Retrieved December 24, 2015. ^ Ken Alyta (November 30, 1961). "Terps' Gary Collins Is All-ACC Lineman; Gabriel of NC State Chosen". The Morning Herald (MD). ^ "1962 Wake Forest Demon Deacons Schedule and Results". SR/College Football. Sports Reference LLC. Retrieved December 24, 2015. ^ "1963 Wake Forest Demon Deacons Schedule and Results". SR/College Football. Sports Reference LLC. Retrieved December 24, 2015. ^ "Department of History". wfu.edu. ^ a b c "William Tate". College Football at Sports-Reference.com. ^ "1964 Wake Forest Demon Deacons Schedule and Results". SR/College Football. Sports Reference LLC. Retrieved December 24, 2015. ^ a b c "Fishman, Piccolo On All-ACC Team". Cumberland Evening Times. November 27, 1964. pp. 40–41. ^ "More Honors: FN releases 33-man team". The Freso Bee. November 24, 1964. referenced April 3, 2009. ^ The Associated Press and Newspaper Enterprise Association selected Piccolo as a second-team All-American behind Gale Sayers, who would later be Piccolo's roommate with the Chicago Bears, as depicted in the film Brian's Song. ^ "Piccolo top grid scorer". Toledo Blade. Ohio. Associated Press. December 10, 1964. p. 62. ^ "Pro loops bypass Wake's Piccolo". Spartanburg Herald-Journal. South Carolina. Associated Press. November 30, 1964. p. 9. ^ "1964 Wake Forest Demon Deacons Stats". SR/College Football. Sports Reference LLC. Retrieved December 26, 2015. ^ "Tate: The good ol' days of football training". news-gazette.com. ^ "Ex-gophers Football Coach Stoll Dead". tribunedigital-chicagotribune. ^ a b c "Cal Stoll". College Football at Sports-Reference.com. ^ "1969 Wake Forest Demon Deacons Schedule and Results". SR/College Football. Sports Reference LLC. Retrieved December 24, 2015. ^ "1970 Wake Forest Demon Deacons Schedule and Results". SR/College Football. Sports Reference LLC. Retrieved December 24, 2015. ^ "1971 Wake Forest Demon Deacons Schedule and Results". SR/College Football. Sports Reference LLC. Retrieved December 24, 2015. ^ a b "The Dispatch – Google News Archive Search". google.com. ^ "1972 Wake Forest Demon Deacons Schedule and Results". SR/College Football. Sports Reference LLC. Retrieved December 24, 2015. ^ "Star-News – Google News Archive Search". google.com. ^ "1973 Wake Forest Demon Deacons Schedule and Results". SR/College Football. Sports Reference LLC. Retrieved December 24, 2015. ^ "1974 Wake Forest Demon Deacons Schedule and Results". SR/College Football. Sports Reference LLC. Retrieved December 24, 2015. ^ "1975 Wake Forest Demon Deacons Schedule and Results". SR/College Football. Sports Reference LLC. Retrieved December 24, 2015. ^ "1976 Wake Forest Demon Deacons Schedule and Results". SR/College Football. Sports Reference LLC. Retrieved December 24, 2015. ^ "1977 Wake Forest Demon Deacons Schedule and Results". SR/College Football. Sports Reference LLC. Retrieved December 24, 2015. ^ a b c d "John Mackovic". College Football at Sports-Reference.com. ^ "1979 Wake Forest Demon Deacons Schedule and Results". SR/College Football. Sports Reference LLC. Retrieved December 24, 2015. ^ "1980 Wake Forest Demon Deacons Schedule and Results". SR/College Football. Sports Reference LLC. Retrieved December 24, 2015. ^ a b "Al Groh". College Football at Sports-Reference.com. ^ "1981 Wake Forest Demon Deacons Schedule and Results". SR/College Football. Sports Reference LLC. Retrieved December 24, 2015. ^ "1982 Wake Forest Demon Deacons Schedule and Results". SR/College Football. Sports Reference LLC. Retrieved December 24, 2015. ^ "1983 Wake Forest Demon Deacons Schedule and Results". SR/College Football. Sports Reference LLC. Retrieved December 24, 2015. ^ "1986 Wake Forest Demon Deacons Schedule and Results - College Football at Sports-Reference.com". College Football at Sports-Reference.com. ^ "Gainesville Sun – Google News Archive Search". google.com. ^ a b "College Football Acc's Wake Forest Names Bill Dooley New Coach". tribunedigital-sunsentinel. ^ a b "The Free Lance-Star – Google News Archive Search". google.com. ^ "1987 Wake Forest Demon Deacons Schedule and Results". SR/College Football. Sports Reference LLC. Retrieved December 24, 2015. ^ "1988 Wake Forest Demon Deacons Schedule and Results". SR/College Football. Sports Reference LLC. Retrieved December 24, 2015. ^ "1989 Wake Forest Demon Deacons Schedule and Results". SR/College Football. Sports Reference LLC. Retrieved December 24, 2015. ^ "1990 Wake Forest Demon Deacons Schedule and Results". SR/College Football. Sports Reference LLC. Retrieved December 24, 2015. ^ "1991 Wake Forest Demon Deacons Schedule and Results - College Football at Sports-Reference.com". College Football at Sports-Reference.com. ^ a b c "Bill Dooley". College Football at Sports-Reference.com. ^ a b "Jim Caldwell Bio – The Official Site of Wake Forest Demon Deacon Athletics". wakeforestsports.com. ^ "1993 Wake Forest Demon Deacons Schedule and Results". SR/College Football. Sports Reference LLC. Retrieved December 24, 2015. ^ "1994 Wake Forest Demon Deacons Schedule and Results". SR/College Football. Sports Reference LLC. Retrieved December 24, 2015. ^ "1995 Wake Forest Demon Deacons Schedule and Results". SR/College Football. Sports Reference LLC. Retrieved December 24, 2015. ^ "1996 Wake Forest Demon Deacons Schedule and Results". SR/College Football. Sports Reference LLC. Retrieved December 24, 2015. ^ "1997 Wake Forest Demon Deacons Schedule and Results". SR/College Football. Sports Reference LLC. Retrieved December 24, 2015. ^ "Wake Forest 27, Northwestern 20". ^ "1998 Wake Forest Demon Deacons Schedule and Results". SR/College Football. Sports Reference LLC. Retrieved December 24, 2015. ^ "2000 Wake Forest Demon Deacons Schedule and Results". SR/College Football. Sports Reference LLC. Retrieved December 24, 2015. ^ a b "Jim Caldwell". College Football at Sports-Reference.com. 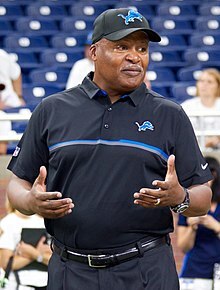 ^ "Wake Cans Coach Caldwell". cbsnews.com. November 27, 2000. ^ a b "Jim Grobe Bio – The Official Site of Wake Forest Demon Deacon Athletics". wakeforestsports.com. ^ "2001 Wake Forest Demon Deacons Schedule and Results". SR/College Football. Sports Reference LLC. Retrieved December 24, 2015. ^ "2002 Wake Forest Demon Deacons Schedule and Results". SR/College Football. Sports Reference LLC. Retrieved December 24, 2015. ^ "2003 Wake Forest Demon Deacons Schedule and Results". SR/College Football. Sports Reference LLC. Retrieved December 24, 2015. ^ "2004 Wake Forest Demon Deacons Schedule and Results". SR/College Football. Sports Reference LLC. Retrieved December 24, 2015. ^ "Florida State vs. Wake Forest – Game Recap – October 23, 2004 – ESPN". ESPN.com. ^ "2005 Wake Forest Demon Deacons Schedule and Results". SR/College Football. Sports Reference LLC. Retrieved December 24, 2015. ^ a b c d e f "Jim Grobe". College Football at Sports-Reference.com. ^ "The Louisville Cardinals Beat Wake Forest In The Orange Bowl 24–13". digtriad.com. ^ "Video: Wake Forest football coach Jim Grobe resigns". News-Record.com. ^ a b "Wake Forest Wins First ACC Title Since 1970". Retrieved July 16, 2007. ^ "2007 ACC football preview". Archived from the original on August 24, 2007. Retrieved September 1, 2007. ^ "Wake Forest Picked To Finish Fourth In ACC Atlantic". ^ "2007 Wake Forest Demon Deacons Schedule and Results - College Football at Sports-Reference.com". College Football at Sports-Reference.com. ^ "Connecticut vs. Wake Forest – Game Recap – December 29, 2007 – ESPN". ESPN.com. ^ "Wake Forest vs. Baylor – Game Recap – August 28, 2008 – ESPN". ESPN.com. ^ "2008 Wake Forest Demon Deacons Schedule and Results - College Football at Sports-Reference.com". College Football at Sports-Reference.com. ^ "Skinner, Wake Beat Navy In EagleBank Bowl". December 20, 2008. ^ "2009 Wake Forest Demon Deacons Schedule and Results - College Football at Sports-Reference.com". College Football at Sports-Reference.com. ^ "2010 Wake Forest Demon Deacons Schedule and Results - College Football at Sports-Reference.com". College Football at Sports-Reference.com. ^ "2011 Wake Forest Demon Deacons Schedule and Results - College Football at Sports-Reference.com". College Football at Sports-Reference.com. ^ "Mississippi State vs. Wake Forest – Game Recap – December 30, 2011 – ESPN". ESPN.com. ^ "2012 Wake Forest Demon Deacons Schedule and Results - College Football at Sports-Reference.com". College Football at Sports-Reference.com. ^ "2013 Wake Forest Demon Deacons Schedule and Results - College Football at Sports-Reference.com". College Football at Sports-Reference.com. ^ "Wake Forest Demon Deacons coach Jim Grobe resigns". ESPN.com. ^ "Wake Forest hires Bowling Green coach Dave Clawson". ^ "GoVolsXtra, University of Tennessee sports coverage – Knoxville News Sentinel". Knoxville News Sentinel. ^ "2014 Wake Forest Demon Deacons Schedule and Results - College Football at Sports-Reference.com". College Football at Sports-Reference.com. ^ "2015 Wake Forest Demon Deacons Schedule and Results - College Football at Sports-Reference.com". College Football at Sports-Reference.com. ^ "Wake Forest vs. Indiana – Game Recap – September 24, 2016 – ESPN". ESPN.com. ^ "College football: Wake Forest survives Temple rally to win Military Bowl 34–26". Retrieved December 27, 2016. ^ "Dave Clawson". Wake Forest University. October 12, 2016. Retrieved October 12, 2016. ^ "Wake Forest rewards Dave Clawson with new 8-year contract". January 3, 2017. ^ "2017 Wake Forest Demon Deacons Schedule and Results - College Football at Sports-Reference.com". College Football at Sports-Reference.com. Retrieved August 8, 2018. ^ "Presbyterian College vs. Wake Forest – Game Recap – August 31, 2017 – ESPN". ESPN.com. Retrieved August 8, 2018. ^ "Wake Forest vs. Boston College – Game Recap – September 9, 2017 – ESPN". ESPN.com. Retrieved August 8, 2018. ^ "Utah State vs. Wake Forest – Game Recap – September 16, 2017 – ESPN". ESPN.com. Retrieved August 8, 2018. ^ "Wake Forest vs. Appalachian State – Game Recap – September 23, 2017 – ESPN". ESPN.com. Retrieved August 8, 2018. ^ "Florida State vs. Wake Forest – Game Recap – September 30, 2017 – ESPN". ESPN.com. Retrieved August 8, 2018. ^ "Wake Forest vs. Clemson – Game Recap – October 7, 2017 – ESPN". ESPN.com. Retrieved August 8, 2018. ^ "Wake Forest vs. Georgia Tech – Game Recap – October 21, 2017 – ESPN". ESPN.com. Retrieved August 8, 2018. ^ "Louisville vs. Wake Forest – Game Recap – October 28, 2017 – ESPN". ESPN.com. Retrieved August 8, 2018. ^ "Wake Forest vs. Notre Dame – Game Recap – November 4, 2017 – ESPN". ESPN.com. Retrieved August 8, 2018. ^ "Wake Forest vs. Syracuse – Game Recap – November 11, 2017 – ESPN". ESPN.com. Retrieved August 8, 2018. ^ "NC State vs. Wake Forest – Game Recap – November 18, 2017 – ESPN". ESPN.com. Retrieved August 8, 2018. ^ "Duke vs. Wake Forest – Game Recap – November 25, 2017 – ESPN". ESPN.com. Retrieved August 8, 2018. ^ "Wake Forest vs. Texas A&M – Game Recap – December 29, 2017 – ESPN". ESPN.com. Retrieved August 8, 2018. ^ "Wake Forest Historical Data". cfbdatawarehouse.com. ^ "Wake breezes to Big Four title, again". ^ a b "Wake Forest Opponents". cfbdatawarehouse.com. ^ "Wake Forest Demon Deacons Football Schedules and Future Schedules". fbschedules.com. Retrieved July 23, 2018.